Quality of life improves with good hygienic practices, access to proper sanitary facilities and improvement of environmental sanitation. Adoption of sanitary practices also reduces disease burden, particularly those which are water borne diseases. This is all the more relevant to the people living below poverty line, who suffer more from such common and preventable diseases due to lack of access to safe water and sanitation facilities. 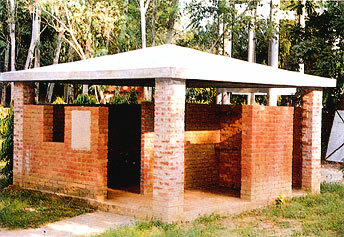 In the interest of sustainable development, access to sanitary facilities and use of safe and quality drinking water have been adduced high priority and the earlier Central Rural Sanitation Programme (CRSP) was scaled up and launched as Total Sanitation Campaign (TSC) as a centrally sponsored programme in the year 1999. The programme is currently being implemented by this department in West Bengal in all the eighteen rural districts including the DGHC area in Darjeeling. The modalities for taking up sanitation programme in an intensive manner in collaboration with the NGOs was developed in Midnapore during the early nineties as described in earlier annual reports. Under this model responsibility of delivery of sanitation related services is entrusted with a suitable NGO in each block on recommendation of the Zilla Parishad. The NGO sets up a Rural Sanitary Mart (RSM) for manufacturing various sanitary items and arranges to install the same as per demand through their trained personnel. Costs of various sanitary items are fixed by the state government and the RSMs are allowed certain profit for financial self-sufficiency. The strength of the programme is participation of the people, which is promoted by the panchayats through generation of awareness about the good hygienic practices. The panchayats are responsible for taking up the campaign in their respective areas and developing an efficient system for delivery of sanitation related supplies and services in collaboration with suitable NGO. Such partnership with the NGOs started as a strategy during the nineties and the same was further strengthened under the TSC. Considerable success has been achieved through the implementation of TSC in the state. At the beginning of the last decade of the twentieth century, only 12.31% of the rural households in the state had access to sanitary toilets and this rose to around 27% as per Census, 2001. After the TSC was launched as many as 49,68,459 numbers of household toilets have been constructed in the state against a target of constructing 91,81,021 such toilets. More than twelve lakh toilets were constructed prior to launching of the TSC under the Central Rural Sanitation Programme. As a result of that around 74% of the rural households had access to sanitary toilets at the end of March 2007. Sanction and release a Grant-in-Aid of Rs. 18.1729 Cr. in the current financial year in respect of 17 districts under TSC.